Looks like these new television series that caught my attention are adaptations from movie and reboot of an old show. This is one of the new TV series that caught my attention upon checking the net for new series this year. Based from a book that was later adapted into a movie last 2000, it shows about an NYPD detective who was able to communicate with her deceased father from 20 years via a ham radio. This gives her the opportunity to save him from his death but has consequences that changes the present. I might as well look for a copy of the movie adaptation of this one. 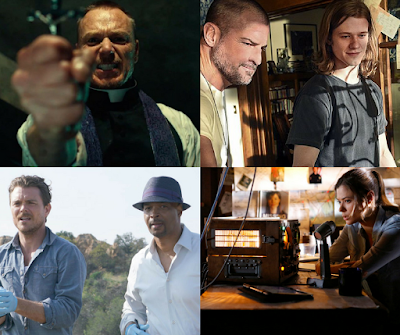 Frequency started last September 21 on ABC and aired every Wednesday, 9PM. After 4 movies, they are adapting Lethal Weapon into a television series. With Damon Wayans and Clayne Crawford, as LAPD Detectives Roger Murtaugh and Martin Riggs. I hope that they can give a new appeal to the characters with this TV adaptation. With Jordana Brewster casted into this series, I might check this out. This new series started last September 21 on FOX and airs every Wednesday, 8PM. I remember watching the original series every Saturday night when it was shown in a local channel (RPN 9 if I am not mistaken). I was one of the many who idolized MacGyver with his simple inventions that can save lives when he is at dangerous situations. This guy made me want to have my own Swiss army knife because it will make me look cool during that time. I hope this reboot will be able to maintain that same excitement I had when I was watching the original series. MacGyver started last September 23 on CBS every Friday, 8PM. This new series is adaptation of the horror film of the same name based from the novel of William Peter Blaty. If you are into horror drama series, you might want to check this one. Based on the trailer, the premise is similar to the first movie, but it's still too early to speculate since I have not yet watch the first episode. The Exorcist started last September 23 on FOX and shown every Friday, 9PM. Hopefully when I am able to watch them I can give my own review if they are really worth watching.